This has been the coldest week here in Tennessee that I remember and we’ve lived here in Chattanooga for more then 20 years. This region is broadly included in that vague area known as ‘The South’. Cold, for us, generally is a night in the 10’s followed by sunshine and days in the 40s soon after. Not this week. For many plants, these temperatures below 0 degrees Fahrenheit predicted for tonight will be a true challenge to some of our plants because we did not get any snow. Why does snow matter? Snow is Mother Nature’s heating blanket for the garden. Snow insulates and protects plants when the temperatures are frightful. If you have been following our facebook page, you’ll know that we love to push Hardiness Zones and grow subtropicals such as canna and brugmansia plants outside. What to do? 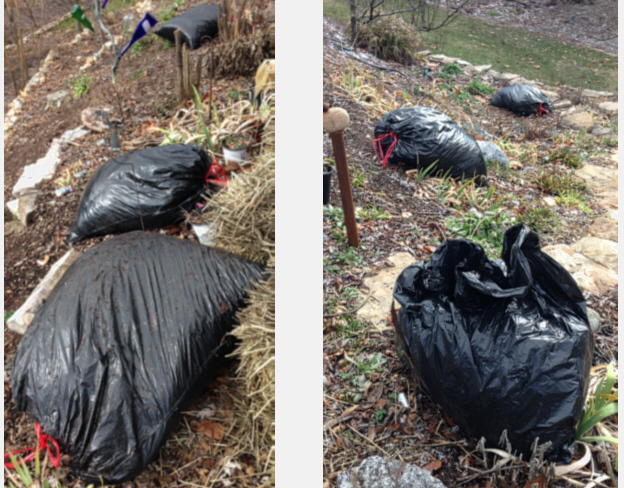 Here’s one solution: We distributed the bags holding our fall leaves (and still awaiting their spot in the compost) on top of our semi-tender plant stumps. Voila – plant blankets – and hopefully they will keep the canna nice and toasty for the rest of this winter. Plastic leaf bags as plant blankets. This entry was posted in Garden, Winter by GreenThumbsBelle. Bookmark the permalink.